A Filipino woman won the gold prize, while a Filipino man and a Canadian woman took home the silver prizes in a soy sauce cooking contest, in which non-Japanese presented 75 dishes made with soy sauce, at a Tokyo hotel on Sept. 30, one day before Soy Sauce Day. The contest is among the events organized by the Japan Soy Sauce Association to commemorate Soy Sauce Day. Oct. 1 was chosen as an old kanji character for October shares common components with the character for soy sauce. Clair Ocampo, a Filipino woman living in Saitama Prefecture, won the top prize for her dish, “Pork back ribs adobo and banana with burned brown sugar,” in the eighth Soy Sauce Recipe & Story Contest. “I have loved adobo since my childhood. I used soy sauce and brown sugar to better bring out the pork’s flavor. Also, to give it an interesting taste, I used hakkaku spice and laurel leaves. My dish is unique and original,” Ocampo said. De Jesus said he wanted to make Philippine food with Japanese ingredients. Zappia created a fusion of Japanese and Italian foods. Italy is her mother’s home country and the “combination of local food culture and the love of your hometown are recipes for new cuisine,” Zappia said. Ten people out of 75 entrants cooked their dishes for the final screening at Hattori Nutrition College in Tokyo’s Shibuya Ward on Aug. 20. Of the 10, the remaining seven, from Singapore, France, Indonesia, Switzerland, Brazil the U.S. and Iran were awarded bronze prizes. 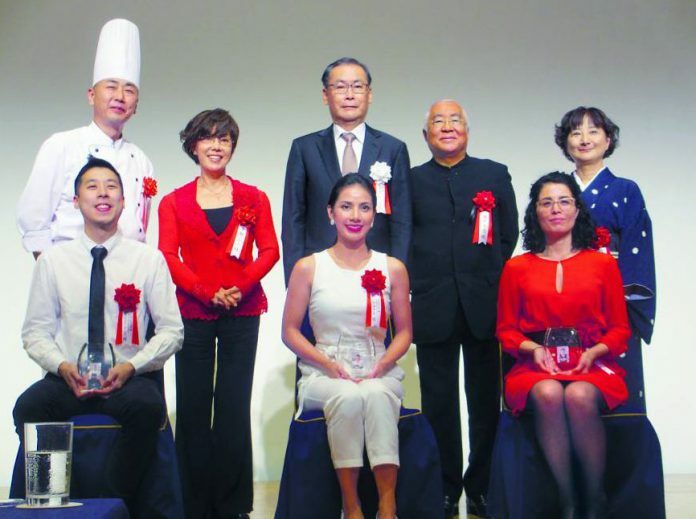 The chairing judge was Hattori Nutrition College President Yukio Hattori, while the other judges were cooking critics Remi Hirano and Akiko Watanabe, as well as Isao Iimura, head chef of the Royal Park Hotel, where the awards ceremony took place.